Abrisa Technologies now offers an extended range of standard stock non-glare (NG), anti-reflection (AR), and anti-reflection coated non-glare (NG/AR) glass and custom solutions, ready to be fabricated to exact specifications. These three options are available for the display designer and integrator to best suit the needs for reduced reflection and glare, throughput efficiency for display brightness, and maintaining image quality. 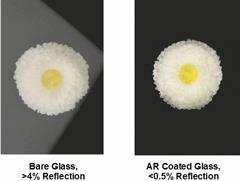 The AR coated glass is designed to deliver diminished surface reflections while increasing light throughput or brightness of viewed images over moderate wavelengths and angular ranges. The NG glass is etched to create uniform and evenly diffusive surfaces that disperse reflected light, preventing glare even at extreme angles. The NG/AR combines improved throughput efficiency, reduction in photopic specular reflectance, and the retention of diffusive surfaces for reduced glare over large angles. For more features, specifications, and benefits for these low-reflection, non-glare glass solutions, download the datasheet.